Give us more off-pitch action. Madden 19 has a story mode called Longshot, and it's hilarious. Devin Wade is a rookie in the NFL trying to keep his spot against fierce competition. Colt Cruise is a washed up player looking to guide his high school football team to glory. You follow both as they go on increasingly melodramatic personal journeys and, occasionally, play some football. Why, you may ask, is any of this in an otherwise serious sports sim? EA Sports has been experimenting with story-driven career modes in FIFA as well, with even greater success. 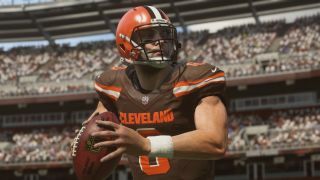 Compared to Madden 18's story mode, Longshot 19 is actually a lot weaker. There are no choices to make about whether or not you yell at your agent, the bizarre gameshow challenges are gone, and the football sections don't seem to impact the rest of the story at all. You just watch some melodrama, then run a few plays, and go back to more cutscenes. When it's good, I almost enjoy it more than the games themselves. Sports games are very good at simulating the trappings of a televised event—Madden in particular excels here with its commentary, on-screen tickers, replays and even adverts. However the games themselves can feel context-free and empty, even in franchise mode where you're dipping in and out of menus between games. There are some nice new touches in Madden 19, like being able to see into your coach's office as he takes calls and taps at his keyboard, but it's no replacement for human drama—even dumb human drama. FIFA and Madden's story modes are also a useful reminder that on the field you see only a small fraction of the total amount of work that goes into a team. In Ultimate Team players drop fully formed from card packs with definitive number ratings attached. There's no sign of the machine that develops youngsters into superstars, and no sign of the kids who tried but didn't make it. There are a lot of good stories to be told, and a lot of fascinating process goes into building a team. I basically want Friday Night Lights: The RPG. I'm sure many players would happily ignore it and just boot up a game every so often with friends around—a perfectly good way to use a sports sim. On PC where you're less likely to be couch-playing and engaging in local co-op, there's more value in a well produced story mode. It also helps to humanise players that can easily feel like little helmeted pawns when you're ordering them around with a playbook. I'm pretty sure every sports game could be improved with some dialogue decisions and some Mass Effect-style renegade conversational interrupts. What's the world of curling like off the ice? What does the seedy underside of badminton look like? I want to see sports games answering these pressing questions in rich, fully featured story modes.